The zBoost YX545 has been discontinued and replaced by the new and improved zBoost SOHO ZB545 Dual Band Signal Booster. 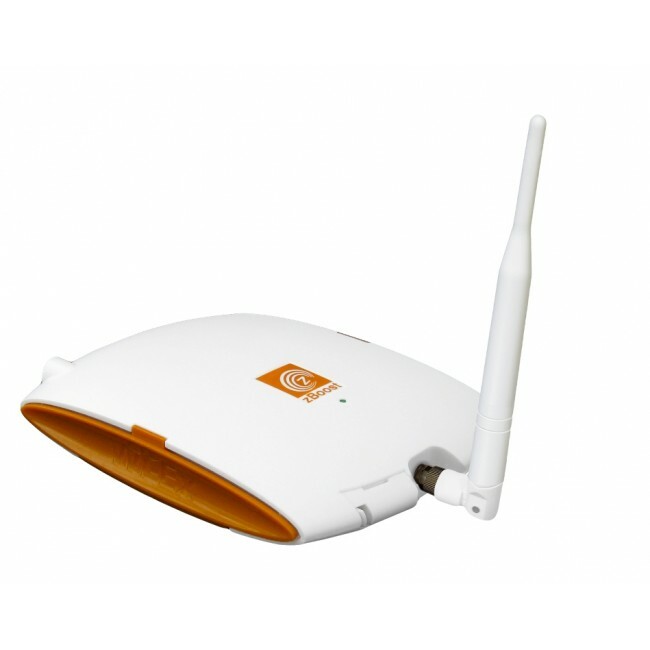 The zBoost SOHO YX545 by Wi-Ex is the best selling home and office cell phone signal booster. The YX545 is a dual-band signal booster and can amplify both frequencies used by all major North American cell phone carriers including AT&T, Sprint, T-Mobile, Verizon, US Cellular, Alltel, Cricket, and others (not compatible with Nextel/iDEN). The YX545 allows you to use your cell phone wirelessly as you normally do and doesn't require a cradle or direct connection to your phone. The YX545 supports up to 20 users simultaneously, which will allow everyone in your home or office to receive a reliable signal. The zBoost SOHO YX545 is easy to install and includes everything necessary in the box. 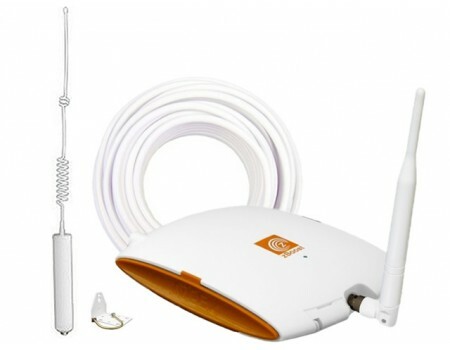 The omnidirectional outside antenna can broadcast and receive from multiple carriers at the same time so everyone in the home or office with a supported carrier will have a stronger signal. Because of the stronger signal, you'll see an increase in data transmission rates and a dramatic decrease in dropped calls or static noise. 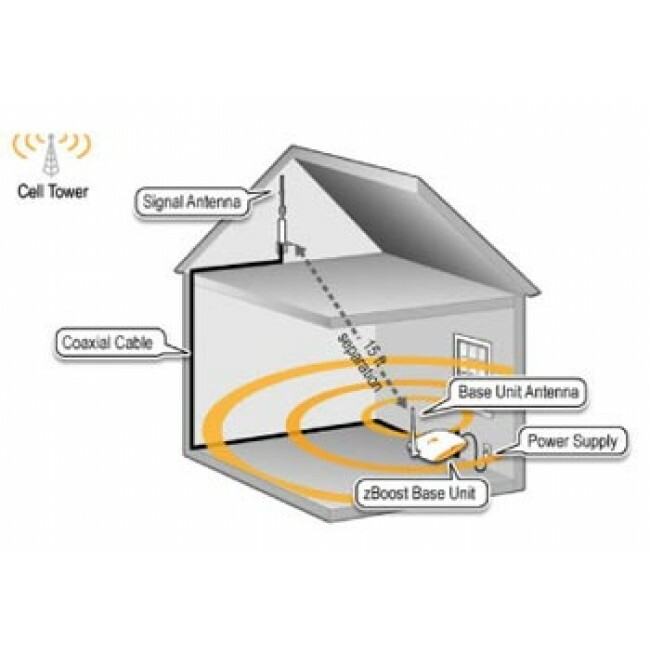 With all Cell Phone Signal Boosters, the actual area that you can cover inside is directly related to how strong the signal is where you mount the outside antenna combined with the strength of the amplifier. With a very strong 5 bar signal outside where you mount the external antenna, it's possible to achieve nearly 2500 sq ft of coverage. However, if you only have one bar of signal outside, your inside coverage will be limited to one small room. Actual coverage area is affected by many factors and is difficult to predict, so when it doubt, give us a call to discuss your situation. For better performance, consider upgrading from the included cable to a low-loss RG6 cable. It's available in 15 ft, 35 ft, and 50 ft lengths. Always use the shortest cable possible to maximize the signal strength and coverage area. For maximum performance, consider the YX545 Premium Kit with a high power directional antenna. The YX545 performs best when covering a single floor and does not work well in multi-story homes and offices. 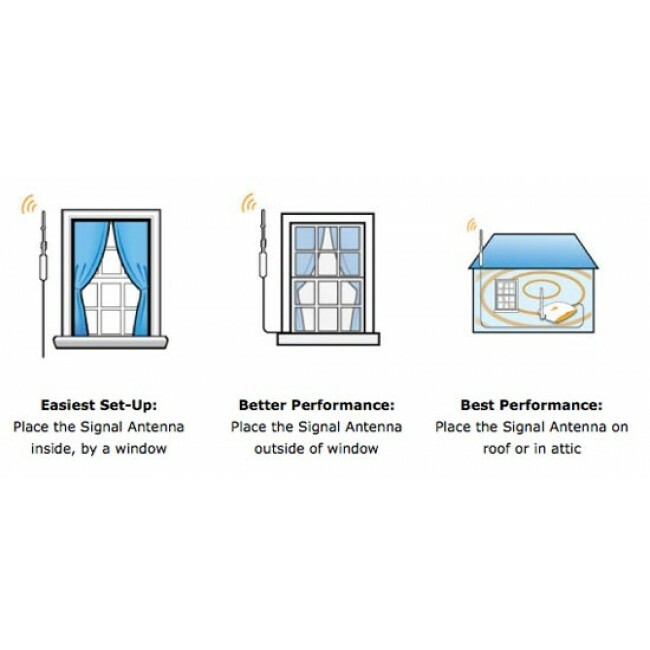 If you have multiple floors, you'll need a signal booster kit with a directional antenna, such as the Wilson DB Pro Omni Kit. The YX545 Premium Kit combines the original YX545 signal booster with the most power Wi-Ex outside antenna to create a system that's more than twice as powerful. You should use the YX545 Premium kit if you have a weak outside signal (3-Bars or less) or if you need more coverage area inside your home or office. The Dual zBoost YX545 & YX550-VLTE-AWS Kit is ideal for people who want to boost 4G data signals in addition to 3G phone calls. 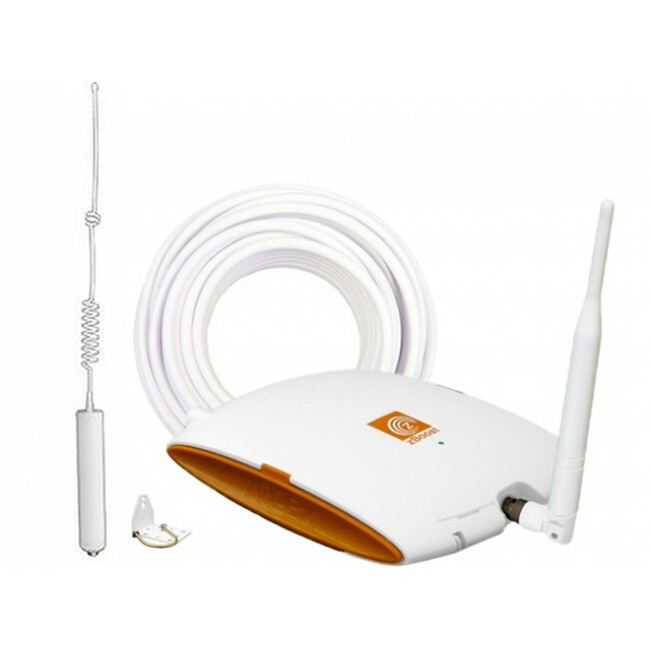 This kit adds a YX550 which will boost Verizon's 4G LTE network as well as the AWS frequency used by T-Mobile, MetroPCS, Cricket, and Canadian 4G LTE networks from Bell, MTS, Rogers, and Telus. The Dual zBoost YX545 & YX550-ALTE-AWS for 3G, AT&T & US Cellular 4G LTE and AWS is ideal for people who want to boost 4G data signals in addition to 3G phone calls. This kit adds a YX550 which will boost AT&T and US Cellular's 4G LTE network, as well as the AWS frequency used by T-Mobile, MetroPCS, Cricket, and Canadian 4G LTE networks from Bell, MTS, Rogers, and Telus. The zBoost SOHO YX545 includes everything needed for a typical installation. To start, decide where you plan to mount the outside antenna while keeping in mind that you need at least 15 feet of vertical separation between the outside antenna and the inside antenna. You can mount the external antenna either inside your home or office (ideally near a window) or outside on a wall or high on the roof. The included outside antenna bracket can be mounted to a pole, like a TV antenna mast, or it can be screwed into a wall. Once you've found the location with the best signal available, mount the outside antenna. Avoid any permanent mounting at this point in case you need to relocate the antenna later. 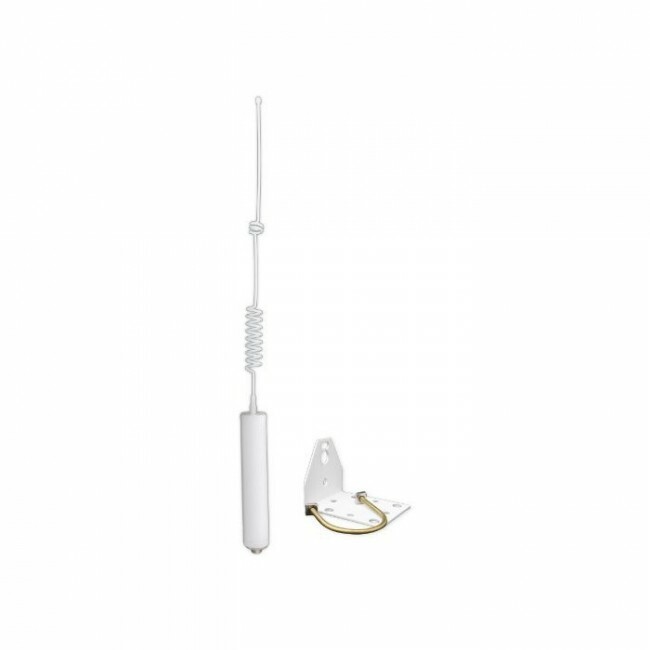 Next, attach the included cable to the end of the antenna and run it into your home or office. Next, you'll need to determine where to locate the amplifier and inside antenna. Ideally, you want it located in the center of the area where you want the boosted signal. You also want to keep it away from large metal objects or wiring that could interfere with the signal. Run the coax cable from the outside antenna to this location and then attach it to the amplifier. Attach the inside antenna to the amplifier unit and then plug in the AC power supply. After a few seconds, you should see a green light indicating that the amplifier is working properly. If you see a red light, or if it's alternating green and red, check the included manual for troubleshooting steps. It's likely that your inside and outside antennas are too close together which results in feedback causing the amplifier to shut down. For more details instructions, watch the video above or check out our complete YX545 Installation Instructions page.